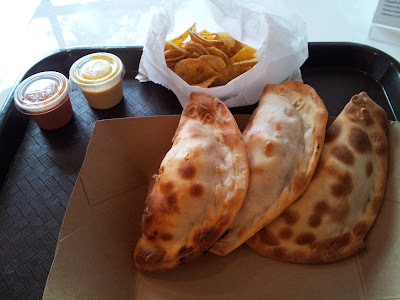 It is fast food " Latin fusion gourmet empanadas" and very different from the food I usually eat. I have seen many vans drive selling empanadas but had not ventured to try them because I was scare of looking foolish not knowing what to ask for. I took the lunch special and a combo of Chicken Pesto, Chicken Melodia and Samba Shrimp. 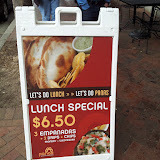 See the picture below and you will see the letters of the dish embossed on the Empanadas. Very delicious and nice with the spicy dipping sauces. Definitely worth a visit and have assortment of Latin American beers including Cusquena.